Today’s animation is rare 1649 clasp bearing a shield of Oliver Cromwell, 1st Lord Protector of the Commonwealth of England, Scotland, and Ireland. It was recovered from the City Point Site on Petersburg National Battlefield in Petersburg, Virginia. 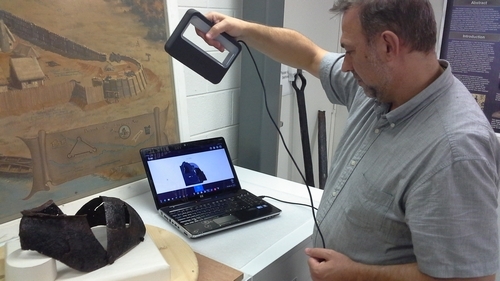 It was scanned Monday, September 29, 2014 at the Fort Lee Regional Archaeological Collections Facility on Fort Lee, Virginia. 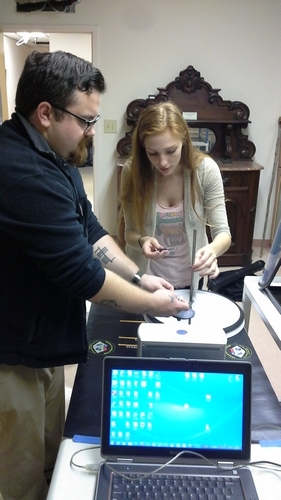 John Bush and Rebecca Bowman scan an artifact at Fort Lee. Today’s animation is 1608 map of Jamestown made by a Spanish spy that has been converted into a 3D illustration. The cross in the center of the map represents a 1608 church recently excavated by Jamestown Rediscovery, as detailed here. By Bernard K. Means, Director of the Virtual Curation Laboratory. Today’s animation is a grommet from the Bladensburg Battlefield site (51NE44) in Washington, D.C. This artifact is part of a larger collection of artifacts from the Battle of Bladensburg that were loan to the Virtual Curation Laboratory to be scanned for the battle’s bicentennial on August 24th, 2014. Today’s animation is a grave marker scanned at Hollywood Cemetery, Richmond, Virginia, on April 9, 2014. The grave marker was for Susie Hutcheson, who lived from 1892 to 1900. The grave marker is missing its right hand. 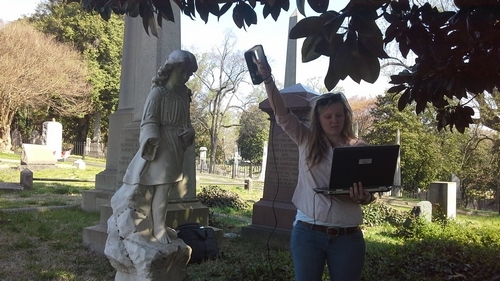 A Sense 3D scanner was used by VCL’s Lauren Volkers to scan the grave marker. Today’s animation is a a close helmet excavated in 2007 by Jamestown Rediscovery. The helmet was carefully conserved in the shape in which it was found, with the visor bent away from the bevor, as detailed here Physically unbending the metal helmet could damage the actual object, but this is not a restriction with digitally unbending. This particular animation derives from a 3D scan using a Sense 3D scanner, which is relatively crude for this purpose, but nonetheless illustrates the potential of digital reconstruction and manipulation of archaeological items distorted from their original shapes. The close helmet will be rescanned with a NextEngine Desktop 3D scanner in the near future.